Sitting next to yesterday's Hirai Ohashi is the Arakawa Ohashi Sobuhonsen, which carries the Sobu Railway over the Arakawa. 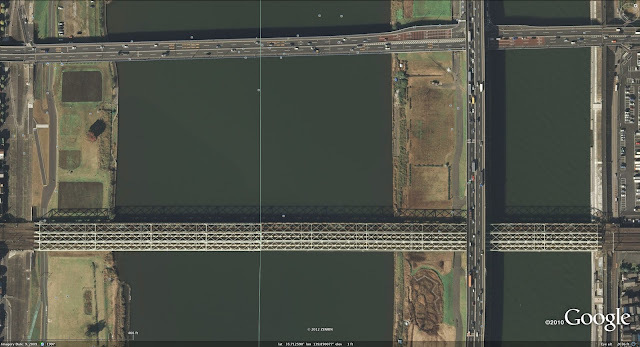 Like many of the railway bridges over the Arakawa, the Subohonsen is a 2400 ft long Warren Truss on concrete piers. However, the Sobuhonsen is unusual because it is three truss bridges built side by side on the same piers. The railway companies must have made hundreds of these 200 ft long Warren Truss segments that were used to build bridges over the Arakawa (and probably elsewhere). The bridge(s) carry six sets of tracks, suggesting that the Sobu must be one of the most popular railway lines in Tokyo. Tokyo, Japan's Bridges: Arakawa Ohashi Sobuhansen by Mark Yashinsky is licensed under a Creative Commons Attribution-NonCommercial-ShareAlike 3.0 United States License.